Powerful tool to help automate keyword research, and identify opportunities to improve your SEO. Moz is one of the most well-known SEO software systems on the market. Its SEO tools help webmasters and marketing teams improve search engine rankings, with the end goal of driving more traffic and customers to their websites. Moz helps streamline several of the key tasks that a business should master to rank well in search engines, such as keyword research, backlink analysis, ranking tracking, site auditing, and page optimization. Moz also provides several proprietary metrics, which can offer important insights that help you better understand your website's current standing in search engines, and identify opportunities for improvement. Useful set of features, and large variety of tools for conducting SEO research. Continuously updated with new features. Cloud-based for easy access from anywhere with an Internet connection. 30-day free trial allows you to test the software fully before committing. Imposes limits on tools to prevent you from exceeding "standard" usage amounts. Only provides access to SEO tools; does not actually provide any services or consulting to help you understand the insights gained from those tools. UI seems less modern, and more difficult to navigate compared to some competitors. Offers various packages starting at $99/month, with most the popular package available at $149/month. 20% discount when paying yearly, as opposed to month-to-month. We'll review some of Moz's key modules to understand why it's considered one of the best SEO tools on the market. Moz's Keyword Explorer module helps you discover and prioritize the best target keywords for your business. You can discover phrases to target based on a variety of metrics, including their competition ranking in organic search, their monthly search volume or the number of searches received per month, and their click-through rate in organic search. Moz also provides a custom priority score that combines these factors, and calculates a score that indicates how much opportunity there is for this specific keyword. Moz is one of the few SEO tools that does this. It also provides a breakdown of SERP (Search Engine Results Page) analysis by highlighting the top-ranking sites in search engines for a given keyword phrase. Within the Keyword Explorer tool, there are many other useful features. Their root domain search, for instance, allows you to search any given domain name and find keywords that the site ranks for in search engines. You can use this feature to analyze competitors and find new phrases to target. The "exact page" search provides similar analysis, but for an exact page of a website. This allows you to see the keywords a competitor ranks for on specific pages, rather than for the entire website. Moz's Open Site Explorer, or backlink tracker, is not as accurate as dedicated trackers like Ahrefs and Majestic, with some users complaining that it misses some backlinks compared to other tools. Moz's link analysis provides you with data about the quality of each website that provides a backlink, which piggybacks off their Domain Authority and Page Authority service. These two metrics tell you how much authority the domain the backlink comes from has, and how much authority the page the backlink is placed on has. This can be a very useful feature when you’re analyzing your competitor’s backlinks and trying to find the highest quality ones to replicate for your own backlink profile. Moz also provides a Spam Score, which estimates how likely the originating domain is expected to be categorized by search engines as spam. 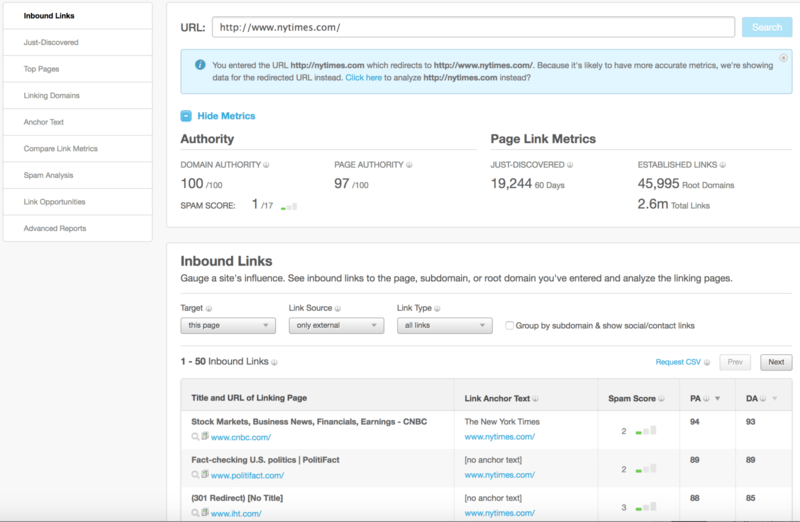 Backlink analysis can also help you uncover sites that have linked to your website naturally. By reaching out to those sites and building relationships, you can continue building a portfolio of authentic backlinks for your website. The backlinks indexed in Moz’s Open Site Explorer are typically the higher quality ones that are on popular domains and easier for their robots to find, so even though they may not capture all backlinks to your site, they'll show you the higher-quality backlinks from authoritative pages and domains. Managing your local business listings can be a challenging process, particularly if your address, phone number, email, or another detail of your business needs to be changed. Google and other search engines rank websites based off the consistency of their NAP (name, address, phone number) details. If these details become inconsistent across your business listings, it could negatively impact your positioning in search engines. Therefore, it’s important to have as many local business listings as possible, with each citation containing relevant and updated information on your business. Moz allows you to check and manage your local US business listings, so that you can easily track down listings you might have forgotten about. Using their tool, you can find these results and update the details of your business in real time. When you’re producing a new piece of content for your website, or trying to identify opportunities for improving existing content, the On-Page Grader in Moz helps provide you with actionable optimization tips. This tool looks for several criteria, and then assigns a letter grade based on how many of the criteria your page satisfies. For example, the tool analyzes the page’s Meta title, URL, Meta description, H1 tag, H2-H4 tags, body, bolded keywords, and image ALT text to see if they contain your desired keyword. 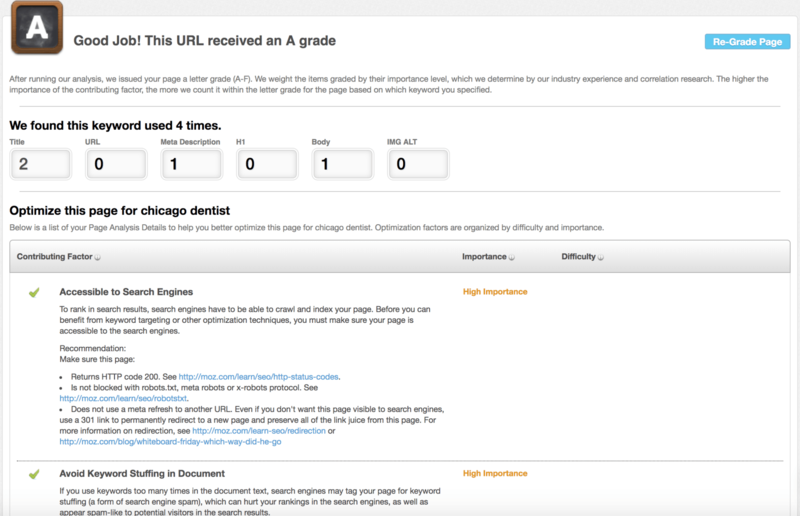 In addition, the On-Page Grader checks to make sure that your site is accessible to search engines, and contains a valid sitemap. If any of the criteria are not satisfied, you'll understand why, and you'll walk away with actionable insights you can use to improve your page's ranking for the specified keyword. When you make changes to your website or build links to your website, you'll want to monitor how the search engines react. The Rank Tracker helps you track changes to your ranking by allowing you to enter keywords and corresponding pages, and monitoring your ranking for those specified keywords on a day-to-day basis. The Followerwonk tool allows you to analyze and optimize your social influencer growth on Twitter. 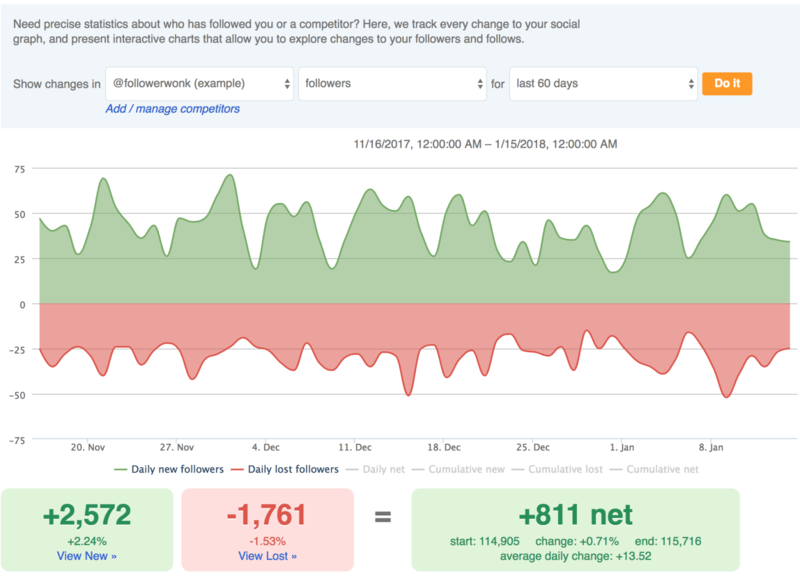 Followerwonk helps you understand who your followers are, and understand your follower growth. Whereas most of Moz is geared towards understanding how changes you make to your website can impact your search ranking, Followerwonk can help you understand how changes to your social media presence can impact your follower growth. Note that in December 2017, Moz announced that it will be spinning off Followerwonk into a standalone company. New Moz users will likely have to purchase Followerwonk separately, but the details on this are still to be determined. 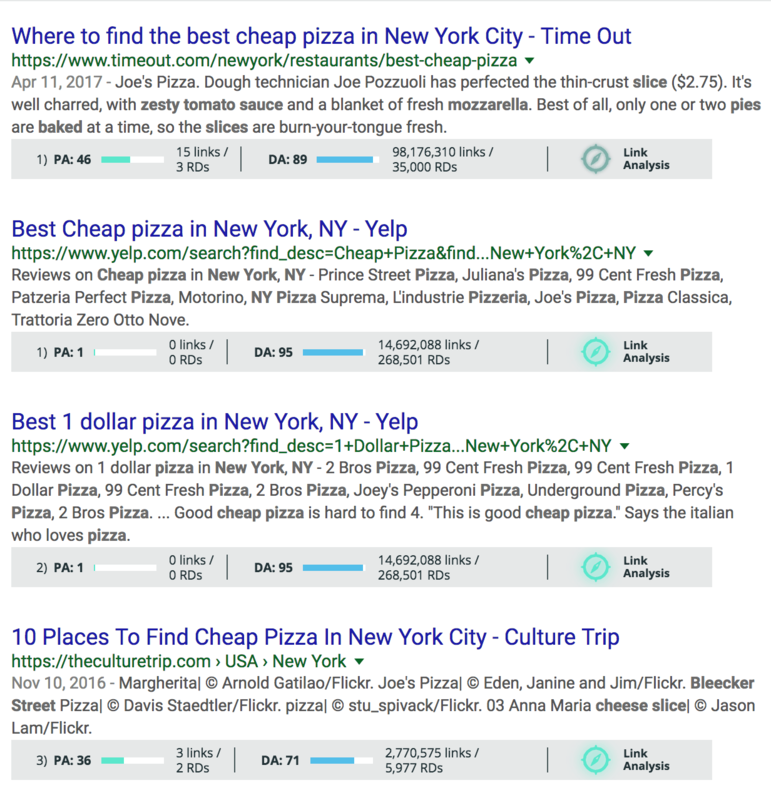 Notice how MozBar gives you immediate access to metrics like Domain Authority, Page Authority, and link totals for the domains listed in Google’s organic results. This makes it easy to search and quickly scan the results to see which competitors to watch as you try to improve your own search rankings. Is Moz right for your business? If you're interested in improving your website's search rankings, then investing in SEO software is a must. If you have the budget, we generally recommend subscribing to several tools simultaneously, as they each excel in different areas, and can help reveal different insights. However, since Moz is a very well-rounded tool, it's an excellent starting point for those looking to get started in SEO, or for those who only have the budget to subscribe to one SEO tool. For more experienced SEO users, you'll likely require more of an emphasis on backlink analysis, which is not Moz's strength. In that case, you may want to purchase a tool that specializes in backlink analysis. However, for many new or intermediate users, Moz's backlink analysis should be more than sufficient, and combined with its exceptional Keyword Explorer, creates a well-rounded system that will help you improve your website's search rankings.